Check out the photos of Steelo performing at Trago in Seattle for New Years 2012. Glad we could close out 2011 and start 2012 with our home town fans! Shout out to our band members Ricardo (Drums), Art B. (Keys), Marvin (Bass), and DJ Xpression. We put it down! Big thanks to Gosa Life and Trago for having us. Enjoy!!! We gotta give a big shout out to DJ PJ from U-92.7FM in Palm Springs, CA for playing “Leave The DJ Alone – Vanguards Remix.” DJ PJ aka Cousin PJ can be heard on the Night Show 6p – 10p. Thanks PJ for supporting the STEELO Movement!!! Big shout out to DJ GQ who recently played “Leave The DJ Alone – Vanguards Remix” on Y100 in Miami. DJ GQ can be heard on Thursdays midnight – 2am. You can also check him out at Miami’s hottest clubs. We’re excited for our fans in Miami to hear this record! Hit GQ up to request it!!! Big shout out to our homey DJ Kemo of the Vanguards. He just posted his brand new mix Live @ Fabric Nightclub in Vancouver, BC. This mix features a special “DJ Kemo” version of “Leave The DJ Alone – Vanguards Remix” and includes Electronica, Latin, Dance, and Top 40 music. Check it out at the 30 min. mark. Listen and download the entire mix below!!! DJ Nick at Nite on 93BLX – The Big Station in Mobile, AL has played our new single “Leave The DJ Alone – Vanguards Remix.” We’re excited for our fans in the south to have the chance to hear this dope record on their radio! Big shout out to DJ Nick at Nite for jumpin’ on this record and supporting the Steelo Movement! Big shout out to Clubdistrict.com for interviewing us and featuring our single “Leave The DJ Alone – Vanguards Remix.” The mission of Clubdistrict.com is summed up on their website: ClubDistrict.com is physically and virtually supported by a growing network of promotional partners in over 20 cities throughout the U.S. The company is very active in helping DJs, promoters, bands, models and other industry talent, known or unknown, gain exposure or become discovered through its national network. To read our full interview click here. 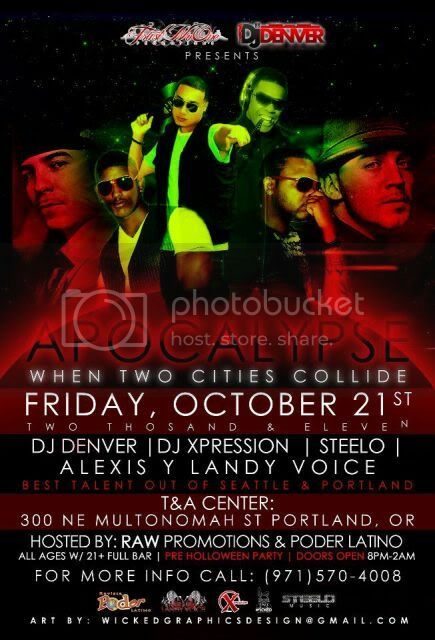 Portland fans get ready! We’ll be live on 10/21. Get all the info. you need on the flyer. Shout out to Trust No One Promotions & DJ Denver! Don’t miss this show! Y100.9FM in Santa Rosa, CA is playing our new single “Leave The DJ Alone – Vanguards Remix.” The station joins 95.7FM The Beat in Santa Maria, as the first two stations in the U.S. to be playing this record! Call 707.585.9999 or click Y100.9FM to request it! 95.7FM The Beat in Santa Maria, CA is the 1st station in the U.S. to play our new single “Leave The DJ Alone – Vanguards Remix.” Big shout out to all the DJs on 95.7FM for supporting our movement! Don’t forget to call the station at 805.739.2805 or 1.866.957.2328 to request it!!! Let’s take this song to the top!! !